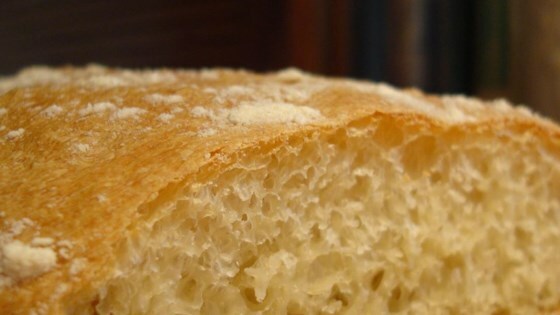 "This very simple recipe can be made in the bread machine using the dough cycle. I make it at least 3 times a week." Dough will be quite sticky and wet once cycle is completed; resist the temptation to add more flour. Place dough on a generously floured board, cover with a large bowl or greased plastic wrap, and let rest for 15 minutes. Lightly flour baking sheets or line them with parchment paper. Using a serrated knife, divide dough into 2 pieces, and form each into a 3x14-inch oval. Place loaves on prepared sheets and dust lightly with flour. Cover, and let rise in a draft-free place for approximately 45 minutes. Spritz loaves with water. Place loaves in the oven, positioned on the middle rack. Bake until golden brown, 25 to 30 minutes. See Chef John make this no-knead Italian ciabatta bread. To make this recipe in a stand mixer, combine all of the ingredients except the olive oil in the mixing bowl. Mix on low speed using the dough hook, scraping the dough down occasionally, for 10 minutes. Add olive oil and mix for an additional 5 minutes. Transfer the dough to a floured board and proceed with the recipe instructions.